Cloud storage and applications are quickly becoming critical to consumers’ mobile lives in a converged world. The age of carrying personal memory devices or mailing documents to oneself is yesterday. Cloud-based productivity tools are now principal and key to manage documents access content and control one’s data from multiple devices. The cloud truly represents the future of storage beyond physical media. 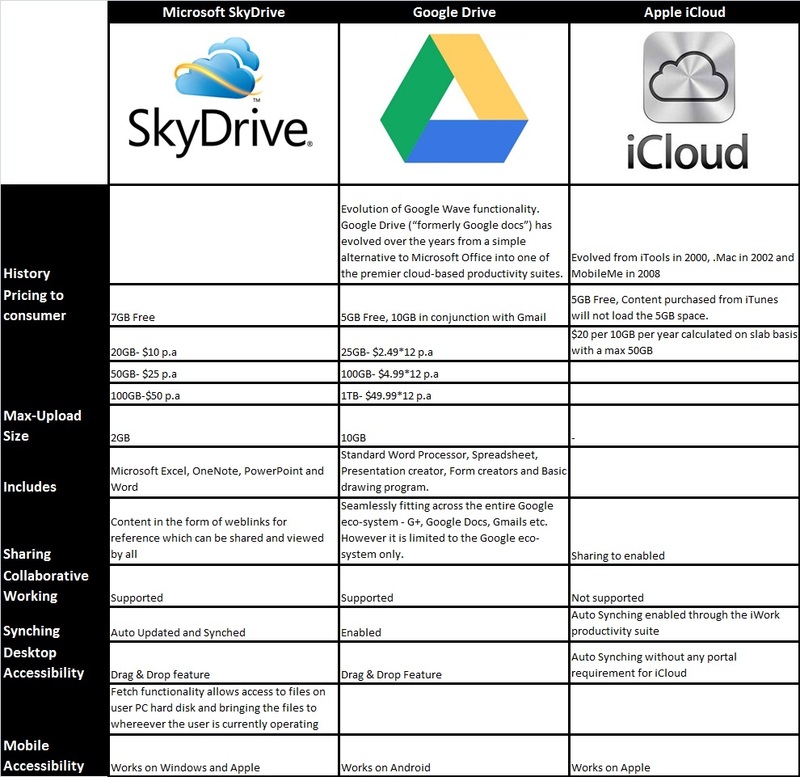 The launch of Google Drive drives the competition in clouds to the next level. Apple, Google and Microsoft (the trio yet again) are at it… each trying to reinvent and redisgn cloud to augment their world of converged services and seamless connectivity. Google starts off from Gmail by providing all account holders 5GB space in the cloud. One can opt for higher capacities in storage albeit for a price. Interestingly enough Microsoft which was magnanimous with 25GB of Skydrive space has offered a miserly 7GB. The cost factor can be a real dampener both for Google and Microsoft. Even while Microsoft seems to have a better product compared to Apple and Google and Google needs to perfect its cloud storage solution….Again the pricing and storage is a masterstroke from Apple given that most of the storage is used in media files. By tightly integrating and controlling media (video, audio and games) in its eco-system and making the storage of such items free, Apple is offering a value to the consumer in terms of judicious and prudent use of storage space. Let the battle of cloud spaces begin….